Hot on the heels of Think's Debut DVD, Parallels, comes Vermillion -- a DVD packed with jaw-dropping card magic. Vermillion also explores Think's take on estimation (a power weapon for any card worker). Think is fast becoming one of the most talked-about card magicians in the world, with the top names in the business praising his work. Now is your chance to learn from this rising star. 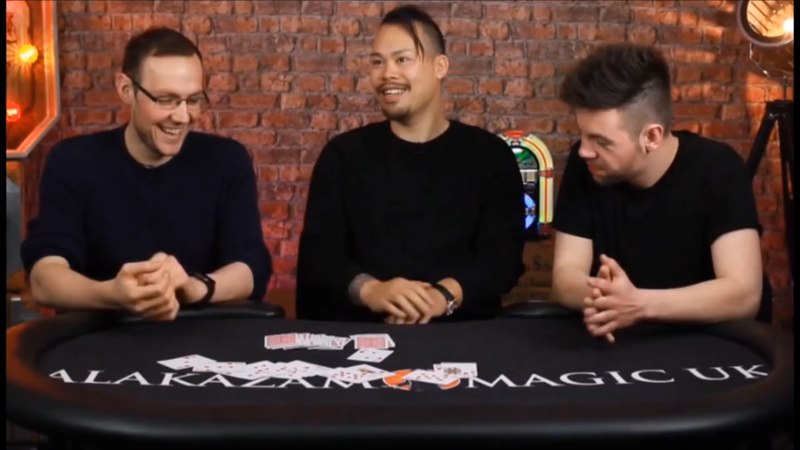 "Think's card magic is fresh and fun to watch and perform. He has a little of everything, devastating subtleties, exciting plots, and technical sleight of hand. I highly recommend studying his work." "Think's creations are a series of lovely beautiful things." "Think is insane! - His performances are slick, and his technique is impeccable. I'm a fan!" "Think creates and performs some of the most intelligent, innovative and original card magic I've had the pleasure of seeing. He combines a love of obscure methodology with a commitment to clear, direct and powerful effects. I'm confident that you'll thoroughly enjoy his offerings." Vermillion will elevate your card skills and amaze your audience! I'm having fun with 9th configuration. That is a very nice effect. There was one scenario that was not discussed though. In the case the four of a kind is all bunched up near the face of the deck, just do a quick wide spread of the first 20 cards or so to check for that condition. If so, just casually cut the deck and check again. Easy fix. Alright so I got this right away I happened to be on Alakazams site right after new years, and I saw it, and immediately purchased since I have heard some great things about Think and his magic. Anyways, you learn 15 routines, some are easy, some are almost self working, and some require you to know some sleights like culling, pass, etc. Some items require preparation of some sorts, others do not. Some deal with gambling themes, others deal with estimation, and presentation and how you want to spin this to your structure and style. Think's magic in a way reminds me a lot of like Joe Barry, some Higham, Tom Rose, and people like that. He is very casual and sometimes when you think he is going to do something, he already did it, and you didn't catch it. Think is good. Now is this DVD set for you: It depends on what style of magic you are looking for and what you are striving to achieve with your magic. If you like magician foolers, some of these might fool your friends, if they havent already heard of think or seen him work. If you like very casual laid back type magic, like Joe Barry, then this might be for you. How will I rate this DVD, and what did I get out of it. Well one one think that with 15 routines, if you can at least use 1 or 2 then you got your moneys worth, since you will be adding that particular routine to your repertoire, I actually got 3 routines that I love and have been practicing, and have actually done 2 out of the 3 already at get togethers and with friends. 3) 1,2,3 Count on me = this is something that you will see and think that the method is transparent, but I have actually done this already half a dozen times, and nobody has figured it out. Easy routine, practically self working. The other routines, involve for example, a triumph type effect, sandwich effects, an effect in which the Jacks jump from top to the middle, very easy to execute, estimation, which this section is good if you already do a version of cutting to the aces,and memory separation, which is like a rain man type effect in which you apparently memorize all the cards and you can prove it, and then you also separate the colors at the end. Very strong effect, but a little difficult to do, plus its not really my type of effect, but for some of you this will be the effect you will be studying. All in all, you cant go wrong with this DVD, if you enjoyed Inscrutable 1 & 2, and Tom Rose's DVD, then you will certainly enjoy Think's Vermillion.